If you’re looking for a warming recipe that’s suitable for the slow cooker, or slow cooking for hours on end this is the perfect Autumnal dish. Full of nourishing vegetables and lentils it is wholesome and value for money. Yesterday I spent a good 20 minutes chatting to my butcher about our options coming into winter. What value cuts we could eke more out of, what pieces of meat that he can get me for cheap and how his business works all year around. I learnt from him, he learnt from me. I came away with some lesser used cuts of meat and lamb shanks. You often find them on the menu in bistros and bars because they are the ideal dish to keep simmering for hours on end and they’re cheap enough to get hold of. 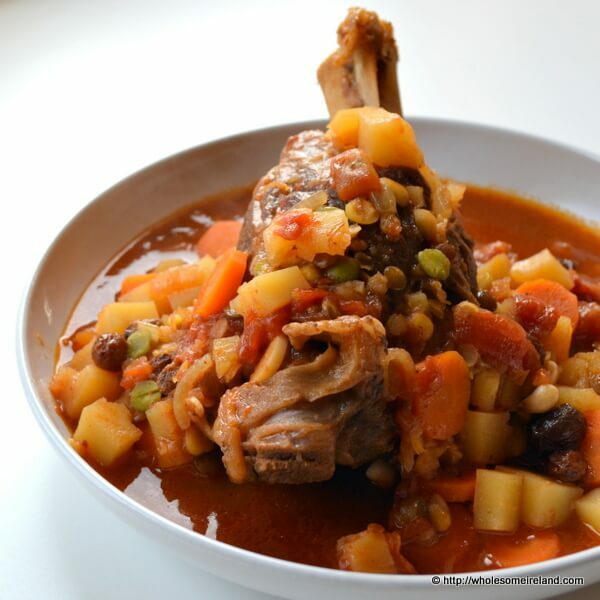 I love cooking with lamb shanks because they are full of flavour, go perfectly with stronger herbs and spices, and I can put them on to cook in the morning and be confident that I will have melting meat and succulent sauces after a long, slow, cook. If you have a slow cooker then by all means pop all these ingredients into the cooker in the morning and leave it to cook, then serve in the evening for dinner. As I don’t have the space, I just use a sturdy, heavy pot with a tight lid on low on the back of the hob. This dish serves 2 adults and 2 hungry children. You don’t need that much meat as the protein in the lentils and beans adds to the meat from the shank which makes it a very frugal dish. The cost for the entire dinner of lamb shank tagine comes in at just under €5. Peel and slice the onions and garlic roughly. Put the saucepan on the hob on a medium heat and add the sunflower oil. Once hot fry off the onions and garlic for 5 mins then add the dried spices. Fry for another 3 mins but be careful not to stick your nose into the heat rising off the saucepan as the chilli has a kick and you will get an almighty cough! Add the lamb shank and fry on all sides until brown. Pour in the tin of tomatoes. Fill the empty tomato tin 3 times with water from the jug and pour into the pot as well. Add the sultanas, mixed lentils and chickpeas. Cover and simmer on the lowest heat setting for at least 4 hours (but preferably 6-8 or more), stirring occassionally. When I say lowest setting, the sauce should be at a slow bubble, if you have no bubble then increase the setting a little. Rotate the shank every now and again to be sure that it cooks evenly. 1 hour before serving peel and cube the potatoes and carrots then add to the sauce mixture. Simmer for a further 45 minutes. Thanks Cathleen it is very yummy. That looks great. We love lamb but it’s hard to find (and pricey) here in the States. 1200. ml of water added? May i assume less water needed if using the slowcooker? Thank you. Hi Jenya, yes, definitely add less water if cooking in the slow cooker. About 600-750ml would be more than enough. Thank you!